If you are looking for a cozy coffee house salon experience specializing in anything but cut and color, then Blowdry Café is your destination. Located at 4740 Reed Road in Upper Arlington, this 6-month-old salon is the hottest salon focusing on wash, blowouts, styling and makeup applications for all occasions. Owners Ashley Blackstone and Jessica Daniels infuse the coffeehouse theme throughout the salon with the specialty coffees they offer, as well as café inspired names for their services. Some menu items include the Cappuccino, which features loose curls, or the Skinny Late for younger guests, ages 3-12. They can also add extras to their “coffee” (services), like Added Crème, which is a conditioning treatment, or add some Sweetener, which is a 10-minute scalp massage. By purchasing the service called Travel Mug, Blowdry Café can conveniently travel to the client. 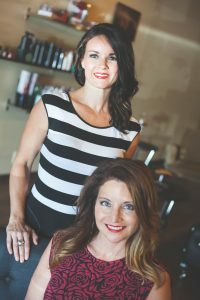 The owners describe their Café as having a “warm and rustic environment, different from most blowdry salons.” Blowdry Café service’s individual styling needs including polished hair, sophisticated styles and updos, as well as servicing the needs of larger groups allowing guests to socialize with each other during their services. Educating the salon’s guests is something Blowdry Café wants to focus on, and they want clients to “walk out more knowledgeable about her own hair, techniques she should adopt when styling herself, and what kind of products will work best for her hair type.” One of Blackstone and Daniels priorities is to help clients maintain their looks even after they have left the salon. Recently Blowdry Café was invited to create looks for a celebrity designer from Project Runway, Althea Harper. This fabulous look was featured in the Fashion Meets Music Festival, in Columbus, Ohio Labor Day weekend. Be on the lookout for a second location for Blowdry Café, coming soon! Visit their website and blog at www.blowdrycafe.com for more information, including services and prices.